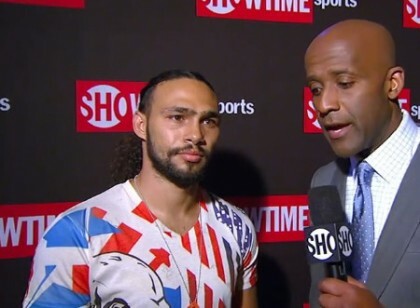 By Matt Wood: Anyone following World Boxing Association interim welterweight champion Keith Thurman (23-0, 21 KOs) knows he’s being underutilized in the boxing game. He remains undefeated and has stopped ten of his last eleven opponents. Despite his stellar record and a very fan-friendly style, he has yet to face a top-1o welterweight. Everyone knows his predicament: he’s a high-risk, low reward fighter who currently can’t bring an A-side fan base. The fact is, a lot of fighters starts out that way. Keith needs a widely publicized fight to help gain a following, and that requires an opponent with a name. Despite being signed with Al Haymon and fighting with welterweight-rich Golden Boy, that big fight is nowhere on the horizon. One can’t help but notice that his previous opponents have gotten bigger names than he’s getting. Diego Chavez, who Thurman knocked out, just landed a December bout with Tim Bradley. Jesus Soto Karass, who Thurman also stopped, just lost to Devon Alexander. His latest victim, Julio Diaz, was coming off losses to Shawn Porter and Amir Khan. Thurman’s fight with Roberto Ortiz is up in the air due to an injury to Thurman’s shoulder, but Thurman can do better than Ortiz. The good news is that at 25 Thurman us still young, and he has no contract with Golden Boy. The details Haymon deal aren’t publicly available, but let’s hope that they aren’t long term. Since his current management doesn’t seem interested in landing him a big fight, I propose that Thurman made a radical move and consider dealing with Top Rank and HBO. The fact is HBO needs a guy like Thurman to inject new life into its stagnant welterweight division. It’s workhorse trio of Manny Pacquiao, Juan Marquez, and Tim Bradley has simply run out of opponents. Just look at their recent activity. As mentioned above, Tim Bradley is headlining a December card against Diego Chaves. Juan Marquez fought Mike Alvarado, a junior welterweight coming off a brutal loss to Ruslan Provodnikov. And to top it off, Manny Pacquiao is fighting Chris Algieri, another junior welterweight, who’s coming off a highly questionable split decision win against Ruslan Provodnikov. So what are Thurman’s chances of getting one of these opponents? First off there’s Pacquiao, who is signed with Top Rank through 2016. Who will Manny face over the next two years after he beats Chris Algieri? Bob Arum has been trying to sell Marquez V, but Marquez seems hesitant to go down that road again, and the public is very weary of seeing these two fight each other. There’s always Tim Bradley III, which is almost certain to happen, but that’s just one fight. They clearly have no interest in putting Pacquiao in the ring with Ruslan Provodnikov. If Bob Arum thinks he can sell Chris Algieri on PPV, he can surely sell Keith Thurman. As I see it it’s a win-win for Top Rank. Out with the old, in with the new. Manny has said he will retire in 2016, so Bob Arum needs to look for the next big thing. Keith Thurman has plenty of talent, a likable personality, and plenty of years left in the tank. Beyond Pacquiao, there’s Ruslan Provodnikov, who has shown that he’ll step up to welterweight for the right opponent. I don’t see Ruslan ducking Keith Thurman. Brandon Rios has been fighting at welterweight, and although he’s clearly not the boxer that Thurman is, he has the mentality to accept that fight. Then there’s Tim Bradley, who’s shown that he will take on all-comers. If Thurman can seal some credibility with a couple of more wins over the next year, a fight with Tim Bradley could be a major event. Maybe this is farfetched, but let’s look at what’s keeping Keith Thurman with Showtime. What would he be missing if he jumped ship? Keith Thurman will not land a fight with Floyd Mayweather. Floyd has two more fights in his Showtime contract, and the short list of his potential opponents is Amir Khan, Miguel Cotto, Danny Garcia, and (sigh) Manny Pacquiao. So who else is there? Maidana has ducked Keith Thurman before and likely won’t resurrect that prospect after two losses to Floyd Mayweather. Amir Khan and Kell Brook won’t happen. British fighters need a major payday to fight a guy as dangerous as Keith Thurman, and that’s simply not in the cards. That leaves Shawn Porter, Robert Guerrero, and Devon Alexander. I would gladly watch any of those fights, but I doubt they will happen. To headlining an HBO card Thurman may not even have to sign with Top Rank given the recent thaw in the Cold War. It sounds strange saying this, but I hope Keith invests more in Oscar de la Hoya than Al Haymon, because Mr. Haymon doesn’t seem to have much interest in selling this fighter. « Who deserves to be elected to the 2015 IBHOF?